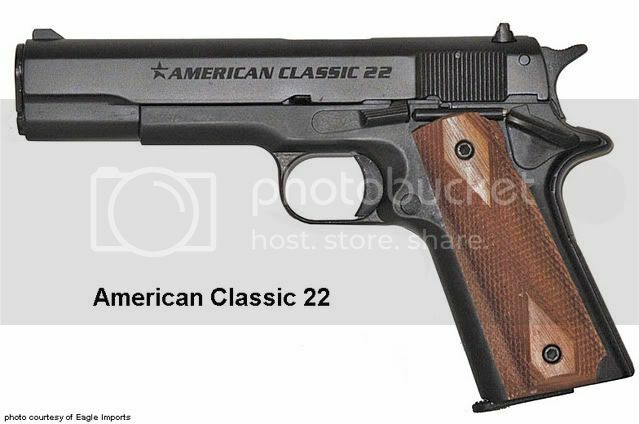 FYI, the American Classic 22 is made by Chiappa. I own a Chiappa Model 1911-22, shown below. It's the exact same pistol except for the grips and the rollmark on the slide. Pictured below is the AC 22. Checking at Davidson's, I see that the AC 22 is currently about $30 cheaper than the Chiappa. This gun has been a great little plinker. I've had it out several times, and with the right ammo it's a lot of fun. Much like my Firestorm 22, it doesn't like Federal bulk ammo, but it runs fine on CCI Velocitors, and it'll shoot Blazer bulk ammo all day long. I'm no expert; I'm just, well, opinionated! I like the grips on that chiappa are better than the AC. Yours has way more class, My ACII came with the worst grips I have ever seen on a gun. I threw them in my smoker. Yeah, you'd think they'd spring for some better grips, even if it raised the price a couple $. But, I've noticed the same thing about all the low priced 1911s. Seems they must all get their grips from the same place. A good refinish job would help them. Did they give a good 45caliber flavor to the smoker??? 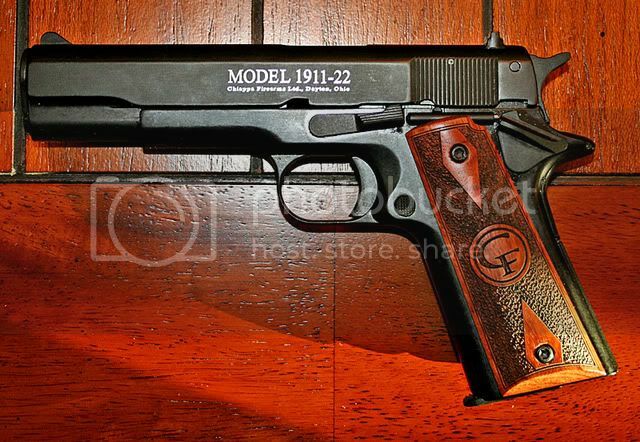 We were trying to give the gun an older 1911 look with the grips. You get an improved finish, only available on the really higher end Chiappa 1911-22's, and 2 mags (Chiappa only comes with one). Davidson's has the last of them. We are discontinuing the gun to concentrate on other things. If you don't like the grips, you have my apologies. We think it is a nice little pistol. You get an improved finish, only available on the really higher end Chiappa 1911-22's, and 2 mags (Chiappa only comes with one). My Chiappa came with two mags. I don't know, maybe that's changed in the last year or so. So does anyone else have an AC 22? How do you like the gun, other than the grips? Fair pistol at best. Mine doesn't even compare to my GSG. Shoots ok and fairly accurate but if mine wasn't a present from a close friend it would be gone in an instant. Could it be a 1911 in 9mm with adj sites ? Since we have both in stock and have sold quite a few I can answer a little on the comparison. The Chiappa does cost more. It comes with a surpressor and handy-dandy tools. The AC-22 is a lot less expensive. Both of them appear a lot lower quality than a 45-1911, but neither really have any serious issues reported. I think this is due to them only shooting 22LR ammo. Both come with a plastic case with foam inside (a major plus compared to the molded plastic that beat up on your firearms, IMHO). To save the $50-60 I prefer the AC over the Chiappa. As to the grips, yeah, they are both sub-par. But people who buy them generally aren't concerned with this when it boils down in the long run. When you are buying a gun to build muscle memory with a 1911, saving another $5 with cheaper grips generally is seen as just another savings. The cheesey white logo on the Chiappa is also a little much for my style as well. Just my 3 cents worth. I hope that it helps. That's a good point about building muscle memory. Never even thought about that. All I know is that I have a lot of fun shooting mine. I've never had an issue when shooting CCI LR ammo; Blazers, Mini-Mags, Stingers, Velocitors, it'll shoot 'em all day long. How is the GSG? I bought a used one (like new) and haven't had a chance to try her out yet. I like mine, but only about 600 rds. thru it so far. 550 of those were the cheap Federal bulk & only a dozen or so failures to feed. Quite a few needed a second strike. Probably stick with Blazer from now on. I just bought my AC 1911-22 at a gun show in Indiana a couple weeks back, and so far I like it. I have only shot maybe 30 rounds so far as I have time, although next week my wife and I are heading to a refresher safety course since we are just picking up the sport again. I bought a Kimber 1911 22LR upper for my Colt Govt. Sr 70 in 2008 and it also fits nicely on my Amigo. I would say spend your money that way as you'll be using the same frame and trigger group and it won't be any different except for the lack of real recoil. It shoots real sweet on either. I looked at the Chiappa and wasn't impressed at all. AC-22 looks identical. Not much to get excited about with either in my hands. Cheaper too. Also the Kimber is available in a suppressor threaded barrel too if you have to have one. Well, one of my goals is a .45, but until that happens, I'm enjoying the heck out of my GSG! I replaced the barrel nose-cone, bushing and ss guide rod and its accuracy improved considerably. Also the flat MSH I installed made the grip a lot more comfortable.